Our lovely Social Pantry cafe on Lavender Hill recently won Best Cafe in the Foodism 100 Awards which was very exciting, whoop whoop. To read the article in full, click here. Foodism is a London-based food and drink website and weekly newsletter. 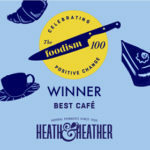 Its annual Foodism 100 list features the 100 best businesses and venues affecting positive change in London’s sustainable and ethical food and drink scene. This year’s awards night was held on 24th January in Greenwich Market. For details of the winners visit here.